The green font color indicates a new text that needs to be proofread by a native speaker. Salsa Dance Classes Nuremberg. - How to dance salsa elegantly and relaxed - couples, singles, young, old and even individuals without dancing partner can learn this at Hotel Cristal (Willibaldstraße 5, 90491 Nürnberg). A salsa dance class for beginners starts on Monday, May 6, 2019, in two groups at different times: 6:15 pm or 8:15 pm. If you miss the first class, a quick start is possible at the second appointment on May 20, 2019. On five evenings with a duration of two hours per appointment Martin Jakubiak gives an introduction to the modern salsa dance style from New York. Further appointments of this salsa course for beginners are on May 27, 2019, June 3, 2019 and June 24, 2019. There is the possibility to continue in advanced courses. The fee is paid in cash at the beginning of the first appointment. The price per person for this salsa dance course in Nuremberg is 80 euros or a reduced price of 60 euros or for students at Bavarian universities a further reduced price of 40 euros. Registered participants receive a discount of 10 euros if they subscribe to both newsletters free of charge. Then the normal price is only 70 euros, the reduced price only 50 euros, the further reduced price only 30 euros. Salsa Dance Classes Nuremberg. - The flyer contains only the next opportunity to start at the particular location. Other course dates via e-mail. Salsa Dance Classes Nuremberg. – The salsa dance classes in Nuremberg take place at Hotel Cristal (Willibaldstraße 5, 90491 Nürnberg / phone: 0911/951190). The hotel is easily accessible by underground train or by car. For the salsa dancing lessons, there is a light conference room with parquet floor and a roof terrace on the top floor. 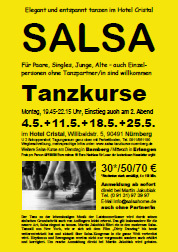 More under: Salsa dance classes in the Hotel Cristal in Nuremberg: address, directions, parking. Salsa Dance Classes Nuremberg. – Salsa dance classes in Nuremberg with Martin Jakubiak as your salsa dancing teacher take into account principles of a sports training and can be offered, nevertheless, at a more reasonable price than in dancing schools. You are allowed to bring your own drinks. Free parking can be found in the residential area surrounding the Hotel Cristal. The prices below are already reduced by 10 Euro discount for registered participants who have subscribed to both newsletters for free. Salsa dance classes in Nuremberg include 10 hours of instruction spread over four or five appointments once a week with a duration of 2 or 2.5 hours. The price per person is 70 Euro or a reduced price of 50 Euro. For a salsa dance class in Nuremberg, including 7.5 or 8 hours of instruction spread over three, four or five appointments, the price per person is 50 or 55 Euro or a reduced price of 40 Euro. The reduced price applies to students, trainees, pupils, volunteers and others who stand before the entry into professional life as well as for the unemployed and welfare recipients. For students of Bavarian universities at the beginning of the semester, a very reduced price is 30 Euro. Foreign students and au pairs can ask for a special offer. If you participate again in the same course, you pay only half of the price quoted. Salsa Dance Classes Nuremberg. - Gift vouchers can be issued for all salsa classes in Nuremberg with Martin Jakubiak as the salsa dancing teacher. After ordering, a gift voucher can be picked up with a cash payment or mailed after bank transfer plus € 5 shipping costs. For your partner, you can pay in cash on the first appointment. Then the price of a Christmas present is due in the new year. For this, a gift voucher is available as PDF for free by e-mail. Salsa Dance Classes Nuremberg. – New Salsa dance classes in Nuremberg for beginners without previous experience usually start in in mid-January, late February or early March, late April, mid-June or late June, in early August, mid-September and late October or early November. The weekly appointments of the salsa dance classes in Nuremberg are usually available on Mondays either in a group from 7:45 p.m. to 10:15 p.m. or in two groups at different times at 6:15 p.m. or at 8:15 p.m. In addition, courses or workshops may be offered on other days of the week or on weekends. Individual tuition for one person, a couple or a private group is negotiable. 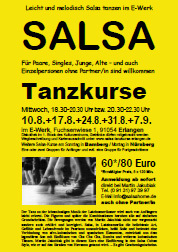 Salsa Dance Classes Nuremberg. – Martin Jakubiak announces his salsa dance classes in Nuremberg over an e-mail distributor. In the newsletter "salsakurse", salsa classes and salsa workshops in Nuremberg and the other training locations in Erlangen and Bamberg are announced. For each course or workshop organizational instructions are given. In order to receive the newsletter please contact Martin Jakubiak - either in person or by telephone or simply by e-mail: Martin Jakubiak, telephone 09131/973997, e-mail info@salsahome.de. Salsa Dance Classes Nuremberg. – In his salsa school the salsa instructor, Martin Jakubiak, offers a wide range of dances and styles: From the origins of salsa to today's trends Martin Jakubiak teaches all major salsa dance styles from Puerto Rico, Cuba, Colombia and all of South America, the Dominican Republic, Brazil, New York, Miami and Los Angeles. The teaching program includes various courses in all the major salsa and mambo dance styles, as well as the dances Merengue, Bachata, Lambada, Cumbia, Cha Cha Cha and other social dances. Salsa Ballroom Style from Puerto Rico and New York also known as Classic Mambo from the cult film "Dirty Dancing" is offered at least twice a year in the salsa dance classes in Nuremberg and the other training locations. More and more often, the salsa dance school in Nuremberg offers the new salsa dance style from New York also known as Salsa Nightclub Style or Modern Mambo.